We have about 20 of these at this time, which were taken out of a commercial building that was being demolished. While there are some repros out there...the thickness of steel and the great 16 ¼" diameter of these true originals are a bit more unique than those thin metal and undersized versions. Some of these pieces even have the original paper labels, as shown. These lights can be customized to have long rods with ceiling canopies, if so desired. Please contact us for pricing. 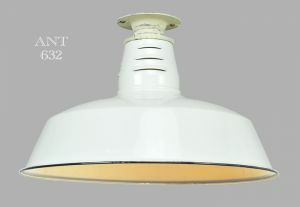 The price quoted above is for this shorter light, as shown. Completely re-wired to UL standards in our UL shop. 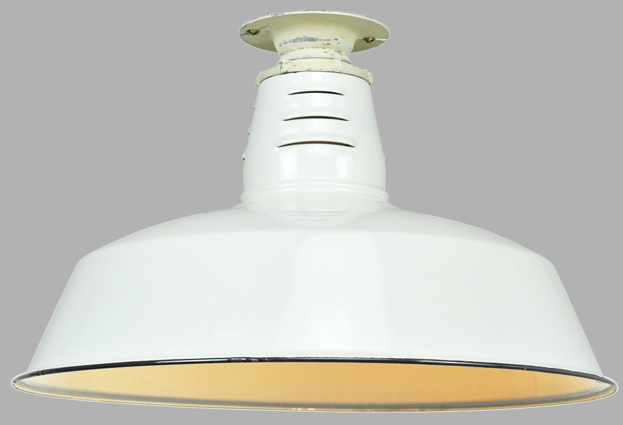 Each socket is capable of 100 watts, and naturally, LED bulbs can be installed, too. 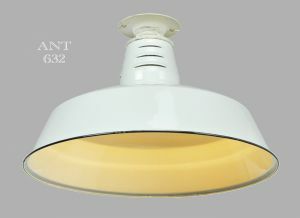 Being older lights...they ARE going to have some condition issues commensurate with their age and use. All are in pretty darn good condition...but perfect is not going to be here. The mounting is shown in the picture. It simply fastens to the electrical box in true industrial manner. It indeed has that Industrial ambiance. Price: $275.00 each, plus shipping costs.